Who is it for? 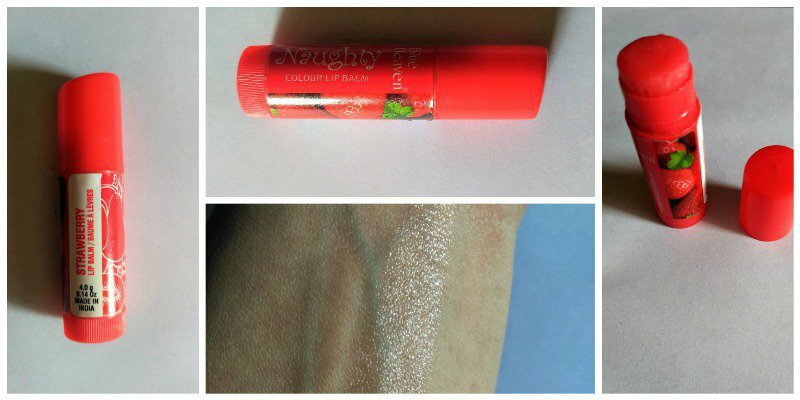 Blue Heaven Naughty Color Lip Balm Strawberry is for all the lovely girls out there who are low on budget and are in need of a basic moisturizing lip balm with a very little tint. It also protects the lips from UV rays as it has SPF 15. This lip balm comes in a little red colored bullet and has a very compact size. The packaging is not much attractive but it is travel-friendly. This is originally red in color and hence gives a very little red tint to the lips but its mostly translucent. It doesn’t cover pigmented lips as it only provides shine and gloss to the lips and not much of a color. The texture is super smooth just as a lip balm should have. Sadly, it doesn’t stay for longer hours and stays for about 2-3 hours and needs to be applied quite frequently to get smooth and moisturized lips throughout the day. It has a very sweet fruity strawberry like fragrance. It is not at all chemical and gives a pleasant feel when applied. I had a great experience with this balm as it is highly budget friendly and provides moisture to the lips with a little gloss. It has a very nice and pleasant fragrance as well. I only didn’t like the fact that it doesn’t cover the pigmentation on the lips but it is a lot to expect from a lip balm at this price. I would highly recommend this lip balm to every girl as it is so budget friendly and can be used as a basic lip balm, it won’t give color to the lips but one can expect good moisturization and protects your lips from UV rays. It does give a glossy finish. This balm is a must-have for every girl. More Blue Heaven Lip Balms? Blue Heaven Lip Bomb Bubblegum – EOS Dupe? Blue Heaven Lip Bomb Cocoa Butter – Cute and Effective! Blue Heaven Lip Bomb Strawberry – Cute Much? Hair Smoothening Process – Everything You Want To Know! The lip balm looks really cute?! Blue heaven makes good lip products.. Much better than their eye pencils..